The Pink Elephant Challenge was the first challenge I ever entered back in May for a Mother's Day card, so how appropriate that I start out the new year with a card for their challenge this week. They are starting the new year out with a bang because their challenge this week offers 2 sketches, you can do one or both, so in a little while I will be posting a card for their other sketch. I just can't resist a challenge. The holidays were wonderful this year(except for a little illness, but that has passed). Thank You to all family and friends and wishing each and everyone of you a grand start to the New Year! Supplies: White card blank 3 1/4" X 8 1/2" Paper Reflections, Papers: Creative Imaginations, We R Memory Keepers, Stampin Up-Whisper White, Stamp: Stampin Up-True Friend, Ink: VersaMark Ink pad, Stampin Up-Bravo Burgandy, Stampin Up-clear embossing powder, Spellbinders Nestabilities-Labels One, pop dots. Love this - just been looking at your other entry too - both are fun cards. Thanks for trying out both our sketches at TPE. 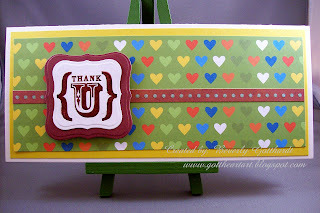 Very cool sentiment image, and once again...digging that heart paper! Great job with the Pink Elephant sketch challenge! What a great card!! I love the sentiment!! Great job with this weeks challenge!! Thanks for joining us at TPE! !